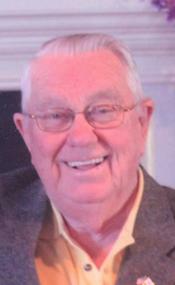 Edward Daniel Barry of East Haddam, husband to Joan (Krauth) Barry, who was born during the blizzard of 1933, on March 21, passed away peacefully during the blizzard of 2013, on February 9, at Chestelm Health Care & Rehabilitation in Moodus, CT. He was 79 years old. Born to Edward and Edna (Danielson) Barry, he grew up in East Windsor CT and graduated from Ellsworth Memorial High School in 1951. He served proudly in the United States Air Force, during the Korean War, from 1951 to1955. After his service, he worked for 20 years as an insurance agent for Metropolitan Insurance Company until he went to work for the State of CT. in 1973, where he was a Veterans Aid Investigator until 1985. From 1985 to 1987, he served as the Assistant Administrator for the Soldiers, Sailors and Marines Fund and then became Administrator in 1987 until his retirement in 1999. Even after retirement, he served as a volunteer representative, helping veterans in need. Ed was very proud of his service and others who served for this country. He joined the American Legion – Post 156, where he served as Department Commander from 2001-2002 and was a member for 45 years. In this capacity, he would tend to veterans in need and cook at the monthly breakfasts. He was also a member of the East Haddam Lions, where he played Santa Claus at Chesthelm Health Care and Rehabilitation for decades, a member of the Knights of Columbus, a 3rd Degree member of VFW Post 3336 and a member of ERIECO Women’s Post 1586 A.L. Men’s Aux. Ed loved to be outside in his yard, especially gardening, and had many beautiful vegetable gardens at his home. He was incredibly knowledgeable in American history and loved to share stories with people and he was always reading an American history book. Living in the country of East Haddam, he enjoyed cutting trees and splitting firewood for his wood stove. He was predeceased by his sister Aileen Brown and leaves behind his five children, Kathleen Barry Twigg and her husband Harry of Rockville, Daniel Barry of Moodus, David Barry of Moodus, Aileen Barry King and her husband Donnie of Vanzant, Missouri and Elizabeth Barry Hahn of East Hampton. Also, he leaves behind four siblings, John David Barry and his wife Glenna of East Windsor, Thelma Pease of Broad Brook, Elizabeth Wheelock and her husband Ed of Broad Brook and Ann Madsen and her husband Edward of Spring Hill, FL. He leaves behind 10 grandchildren and 3 great-grandchildren and many nieces and nephews. We would like to extend a very special thank you to Dr. Robert Dwyer of Essex and the entire staff at Chestelm.